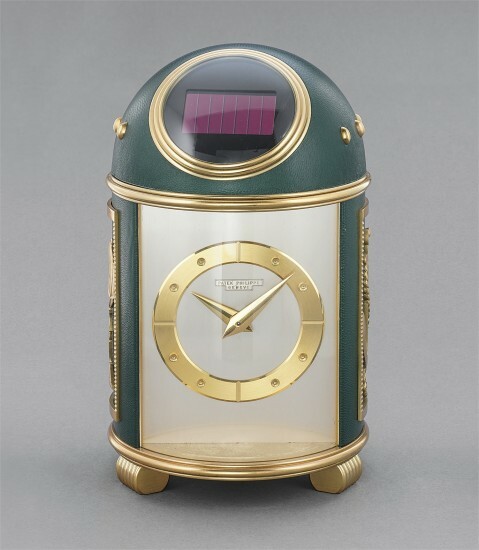 Signed: Case, dial and movement signed, base with inscription "Au Dr. W. Lützelschwab en Signe D'Amitié et en Souvenir de L'immeuble Pax à Genève 9 Mai 1959"
Displaying a marine-style decoration, the present dome clock features a beautiful green leather exterior in lieu of cloisonné enamel, both of which are confirmed by the Patek Philippe Extract from the Archives. While one panel displays an anchor, others depict a globe, sword/sphere and a compass. The base of the dome clock is engraved "Au Dr. W. Lützelschwab en Signe D'Amitié et en Souvenir de L'immeuble Pax à Genève 9 Mai 1959". The engraving is also mentioned in the Extract from the Archives. One can surmise that Dr. W. Lützelschwab was inextricably tied with L'immeuble Pax. Further research reveals that Wilhelm Lützelschwab was born on January 30, 1905 in Latvia. He moved to Switzerland at age 14. Rising through the ranks in civil service, he eventually became involved in public affairs and the Swiss Intelligence Service. Lützelschwab was known as an expert in matters relating to the political police. From 1949 to 1975, he was involved in the management of "Pax" life insurance company. Leather clocks are extremely rare to come by. To date, no more than a handful have reappeared on the market. Leather is particularly prone to flaking and breaking down due to moisture and the elements. To find one fresh to the auction market is nothing short of a spectacular discovery. Case, dial and movement signed, base with inscription "Au Dr. W. Lützelschwab en Signe D'Amitié et en Souvenir de L'immeuble Pax à Genève 9 Mai 1959"